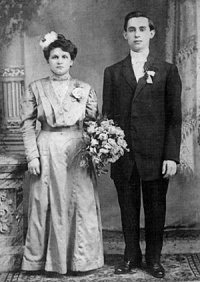 William (Willy) Wilkanowski was born in Poland in 1886 and emigrated to US as a young man. He was a violinist and played in a polka band at about the time he started making violins. 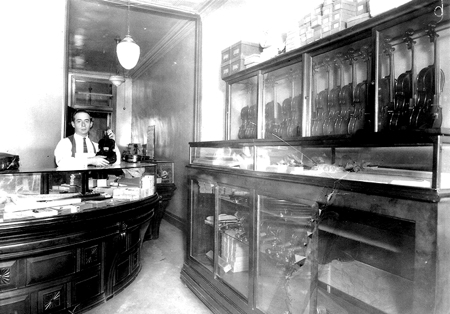 He initially worked for Oliver Ditson in Boston during the 1920s and eventually set up his own shop at 85 Nassau Avenue in the Greenpoint section of Brooklyn, NY, a building of which he subsequently became the owner. 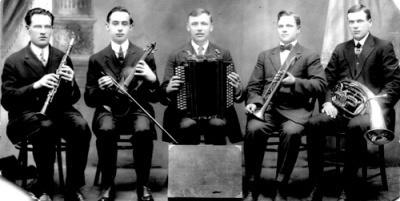 During the Great Depression of the 1930s Wilkanowski’s business did well and he employed several family members to help with the production of instruments. His guitars were labeled ‘Wilkanowski and Son’, although we don’t have absolute proof that his sons had a role in the business. We do, however, know that there were other relatives who participated in the construction of violins and violas. One in particular was a Maximillian Wilkanowski, who might have been a brother or cousin. In the late 1930s Fred Gretsch, a prominent guitar manufacturer in New York, took a great interest in Wilkanowski. Gretsch marketed Wilkanowski’s violins and persuaded him to manufacture high-end acoustic guitars that would compete with those of D’Angelico and Gibson. Between 1936 and 1940 Wilkanowski made about 30 of these guitars, which are highly valued today. Johnny Cash played one which was sold at auction after Cash’s death in 2003 for over $30,000. Wilkanowski was an extraordinarily prolific maker and, according to John Fairfield’s Known Violin Makers, he had produced over 5,000 instruments (violins, violas and guitars) by the early 1940s. His label was simple: ‘W. Wilkanowski, violin maker’ with the year and a serial number. Some instruments carry an internal brand with his name and from the 1940s many also have the ‘W’ monogram purfled into the back just below the button. The identification of earlier work from the Ditson period without the ‘W’ requires an experienced eye, but is unmistakable although not as refined as his 1940s instruments. During the World War II years Wilkanowski’s shop did very well due to the fact that European and Japanese instruments were not able to be imported into the US. There is even evidence that some Wilkanowski instruments carried the Juzek label. He also made violins and violas for the New York City school system during this time. 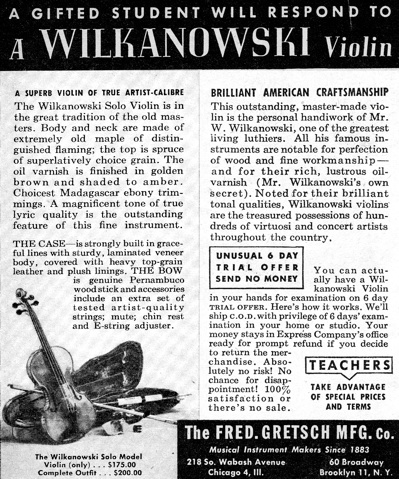 After the war Gretsch placed advertisements for Wilkanowski violins in Etude magazine, which at the time was a major classical music publication. It featured articles on performers and composers in addition to adverts for the major music schools, teachers and instrument manufacturers. This must have helped increase demand for his work, especially as just after the war there were still few if any European instruments being imported and the only other stringed instruments made in great volume in the US were those by Guldan-Jackson of Columbus, Ohio, which were not nearly of the high level of Wilkanowski. In 1950 Wilkanowski sold the property at 85 Nassau Avenue and moved the shop into his home in West Hempstead, Long Island. It’s unclear if this was to eliminate the 25-mile drive each way from West Hempstead to Brooklyn, or to be with his wife, Amelia, who was in poor health by this time and may have needed medical attention making it necessary for him to be with her. The death of Amelia in 1952 caused Wilkanowski to become despondent and he appears to have produced no instruments after this time. His income ceased and bills accumulated. Finally in late December 1954 he took his own life in his West Hempstead home. He is buried next to his wife at the Holy Rood Cemetery in Westbury, NY. Together they had raised nine children: sons Henry and Theodore, and seven daughters, Natalie, Viola, Caroline, Helen, Genevieve, Florence and Irene. Upon his death a number of unfinished, dusty instruments were found in Wilkanowski’s home. Although his personal production had probably ended in 1951–52 there are instruments existing with dates later than 1952. 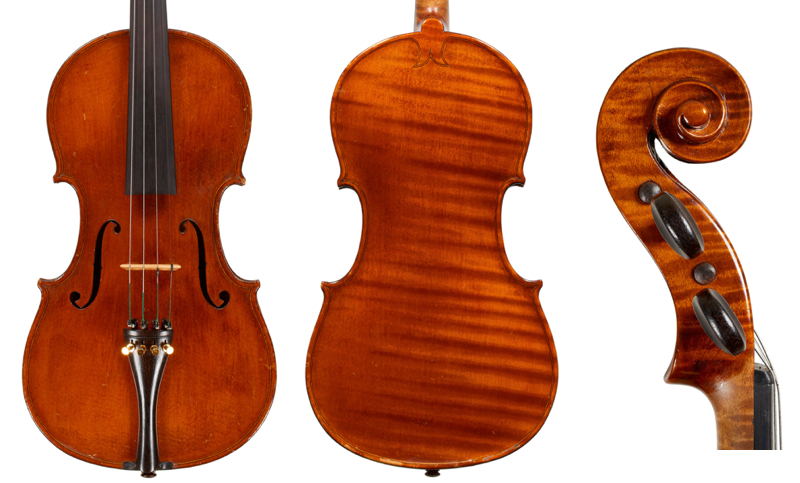 These were possibly finished by other family members or other violin makers, not by Wilkanowski himself. Today Wilkanowski’s instruments have risen in value and frequently turn up in violin shops throughout the US; we have also seen them in Europe and in Asia. Many are in excellent condition and give a very accurate account of his work. Wilkanowski instruments are remarkable for their consistently high quality of workmanship and materials throughout his career. Some have criticized their tone due to the fact that most are quite heavily built. He had a unique feature whereby he would reinforce the tops and bottoms of the f-holes from the underside to help prevent cracking of the top plate. He used an oil varnish of his own formulation, which ranged from a medium amber color to medium red to a very dark red-brown on some of his 1920s instruments. Wilkanowski was influenced by the works of Amati, Stradivari and Guarneri and occasionally even Stainer; however, his violins have their own character that is immediately recognizable. His instruments can be described as ‘robust’ and although they are based on the classic masters, they are truly individualistic and reflect the creativity of a master violin maker. Ira Kraemer is a violist and founder of Ira B. Kraemer & Co., Fine Violins in New Jersey. Thanks to Patricia Wilkanowski, granddaughter of William Wilkanowski, for family photographs and information.